How many pages print in 1 min? 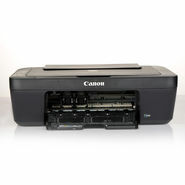 If we have a separate mobile, laptop or tablet connected with Wifi, so it is possible to take print out from all devices at the same time? Please guide me about EMI details for this product. How many copies can be printed in this machine? What is the warranty period for this product? Is there any return policy for the same if I don't like this product? Can we take Letter Size Printout in this Printer? Can this device print colour photo?